Through the empty village streets, blind and invisible, I stumble. The sidewalks might be paved in mediocrity and miserably mainstream void, but what do I care? I have my ears filled with the sounds of MY streets, and they gleam with the sun spangled sheen of a new playlist. 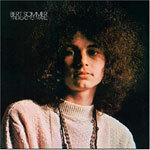 Kicking off then with the darkly titled ‘Brink Of Death’ by Bert Sommer from his The Road To Travel set, recently reissued on the mighty Rev-Ola label. With his immense perm and chunky knit Aran sweater, Bert looks every bit the part of late ‘60s / early ‘70s singer songwriter, and well he should. For Sommer was behind such class moments as the Left Banke’s ‘Ivy Ivy’ single, and co-wrote material for the likes of Montage and Stories. He even scored a Wahorl movie, for goodness’ sake (the Warhol / Ultra Violet Hot Parts). So now, 38 years after it’s original release on Capitol, we can all now marvel at this incredible debut. And incredible it certainly is; full of sweetly orchestrated soft psychedelia that scratches under your skin. This is essential listening for anyone remotely intrigued by the late ‘60s scene, and hey, why wouldn’t you be? I just wish more people would be tempted to dig deeper than the obvious reference points. I mean, how many more collections of the same old obvious Hippy Rock schtick can one take? Especially when there are so many precious diamonds like this to be picked up. And whilst of course I’m sitting here preaching to the converted, sometimes you’ve just got to gripe. Of course Rev-Ola have been playing the salvage operation for some time and are masters of the game. Close relatives El are pushing Mr Foster and his band of merry archaeologists hard though, putting out some sparkling and strange titles rescued from the dusty vaults. The recently released Pufnstuf and Bugaloos soundtrack albums are amongst those gems and are fabulous collections that glow with the warmth of a more innocent time. They thrill with a heady optimism from a time when the possibilities of Psychedelia were woven delightfully into the threads of sunshine Pop rather than those of sludgy rock. Now H R Pufnstuf and Bugaloos were apparently TV shows much beloved by the Gen X’ers, but I don’t know about that. Personally I don’t remember either of them, though I do recall being in thrall to The Banana Splits and the original Josie and The Pussycats (perhaps through the muddied mirror of re-runs or invented memories), whose contemporaneous antics Bugaloos apparently nodded. Then again, I was only between four and six years old when the Bugaloos show ran between 1970 and 72, so forgive me please. Ditto H R Pufnstuf, and the big screen spin off that provides the soundtrack to the El album. So listening to these soundtracks now is a delightful experience, unburdened by memory. The songs beam in from an enchanted place where dreams of a harmonious and peaceful world of understanding, tolerance and love were untainted by the irony or scepticism of times to come. And in these days of what seems like increasingly fraught conflict between various fundamentalist doctrines, that seems both frivolously quaint and wonderfully brave. Best of all though is Mama Cass (as Witch Hazel) doing the superb ‘Different’. Well, any Mama Cass recording is pretty much guaranteed to get my head spinning, but to hear her sweet tones sing out about how “it’s not so bad to be different, to do your own thing and do it with heart” and how she’d “rather be different than be the same”, well, let me tell you, I’m in the clouds grinning and thinking, man, this song should be compulsory listening in school assemblies. And what’s so great about it is that it doesn’t try too hard. It just sets off for the stars and tells it like it is. Forget measured poses and emo-chic, for as the man said “you don’t have to be weird to be weird.” The naturally strange and quietly special are always the ones to watch. Then there’s The Cowsills and their ‘angelic psychedlia’. It’s so hard to resist something so sparkling and magical as a great teen Pop group, and this bunch were right up there with the Monkees in the mid to late ‘60s. Indeed they really were the blueprint for the likes of The Partridge Family or The Osmonds, though if you wanted to be pernickety you could probably say the same of The Beach Boys. And incidentally, Sid and Marty Krofft also went on to produce the Donny and Marie and Brady Bunch Hour TV shows. 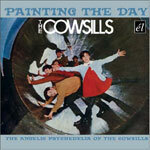 Anyway, The Cowsills’ Painting The Day set collects their numerous US hits, along with the entire 11X11 album, which really was a brilliant piece of psych-pop that, much like the output of, say, The Millennium, The Tokens, Yellow Balloon etc has been airbrushed out of a lot of pop cultural history in favour of the overweight rock orthodoxy of the era. It’s good to see people like El and Rev-Ola keeping the faith, however, and making these excavations available to new generations. And incidentally, did you know that The Cowsills’ version of the title song from Hair was the only song to be officially banned in Vietnam during the war? And that Bert Sommer was in the cast (playing the Woof character) in the controversial first Broadway run of the same show? As someone was want to say, it all fits. Okay, so rushing right up to date now, and guess what? Here comes some Swedish Pop to get your hearts racing. First up there’s the sub two minute rush of Everyday Mistakes’ ‘Like I Care’ from their excellent A Melody I Just Made Up EP. This track reminds me of the always challenging and electric Action Painting!, most especially of their perfectly formed and flawed debut 7” on Sarah all those years ago. It’s nice to see such a blueprint passing down the decades, informing a new generation to make a Pop noise that is all awkward angles hiding under perfect melodies that crash together and pull apart like fraught teenagers on first dates. 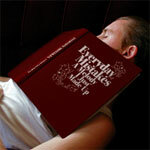 Now I know next to nothing of Everyday Mistakes except that the rest of their EP is equally precious and essential listening and that you should track them without delay. Similarly worth tracking down is the ‘Baby I Love Your Way’ / ‘To Be With You’ single by Irene. With horns blasting out like Pale Fountains and a sound that sets sail for the cloudless skies of Spring, this eight piece sparkle and seduce like a troupe of Postcard loving, Northern Soul collecting, Girl Group adoring outsiders. What more could you wish for? And guess what? They’re from GOTHENBURG! Man, if the thought of relocating and moving house again didn’t fill me with such dread, I swear I would be SO there right now. Well, we can always dream. And really, looking at my recent listening collection, it feels a bit like a virtual Gothenburg here in this corner of Stoke Canon. Maybe we should name our house ‘Little Goteburg’… maybe not. 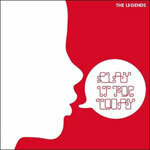 Another super snazzy Pop single that’s been playing lots here has been The Legends’ ‘Play It For Today’. Like the Irene single, this is on the ludicrously prolific and classy Labrador label, and is as catchy and quirky as you should have come to expect. More electronically orientated than their stunning dreampop drenched debut Up Against The Legends set, but not as Cure infected as the Public Radio album, this sees The Legends finding some kind of marvellous middle ground where kids daydream of pink plastic keyboards and heart shaped rose coloured glasses. And I swear if I were sixteen today I would be wandering the corridors of my school with a Legends badge proudly pinned to my purple lapel, rebuffing the taunts of my asymmetrically haircutted peers and forging my lonely furrow into the future. As it is, I’ve got ‘Play It For Today’ ringing out in my head and in my heart, filling me with the urge to get up and get out, to continue to plough that same furrow for today and evermore. It reminds me that no matter where you are, no matter how invisible and isolate you feel, you can always have a friend in music, can always rely on the strength of song to pull you through.